Preseason favorite Green Bay started their Horizon League season with a convincing 63-42 win over rival Milwaukee on Friday afternoon at the Klotsche Center. The Panthers (5-6, 0-1 HL) shot just 24.5% from the field, including just five of 20 from three-point range. The Phoenix (11-2, 1-0) outscored the Panthers 28-12 in the paint, winning their eighth straight game. 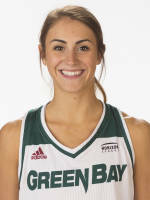 Guard Kaili Lukan hit 8-of-12 from the field to lead Green Bay with 17 points. Allie LeClaire added 15 points and center Lexi Weitzer pulled down 16 rebounds. For the Panthers, sophomore guard Jenny Lindner was the only player in double figures with 12 points.